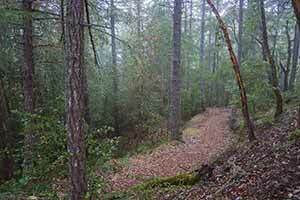 This is an all-day hike through the center of Pescadero Creek County Park. 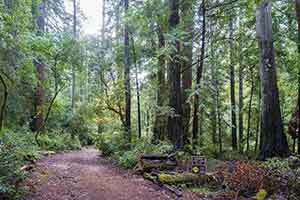 The scenery is generally a little dull, but it gradually improves over the course of the hike, and several lush stands of redwoods keep the walk interesting. Although the woods are mostly second-growth, the highlight of the trip is a fine-looking redwood grove near the end that appears to be old growth. The entire hike is well away from any sort of development (except Honor Camp) and gets very few visitors; after the Shingle Mill Trail there’s a pretty good chance that you won’t see anyone at all on this loop. 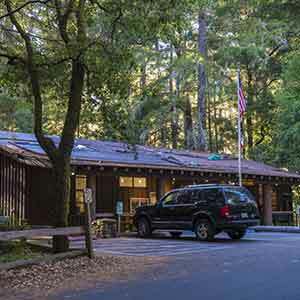 Start at the Tarwater Trailhead, accessed by a scenic single-lane road off Alpine Road. Take the Shingle Mill Trail, which is a gated dirt road (which actually more like a singletrack trail) at the south end of the parking lot. The road descends through a nice hardwood forest, encountering a big spruce tree near the beginning, then a huge candelabra-shaped redwood further down. 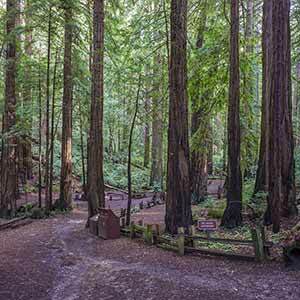 The road narrows into a trail and abruptly enters a strikingly dark, cool redwood grove that was heavily logged in the 1970s. The forest still looks torn-up and is rather gloomy. 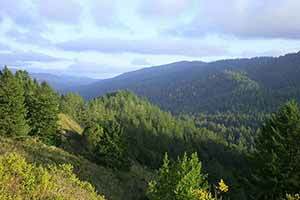 Just before the trail ends, though, the dismal landscape gives way to an attractive and much healthier-looking area of redwoods with no visible signs of logging. The trail emerges onto the much more open Pomponio Trail. 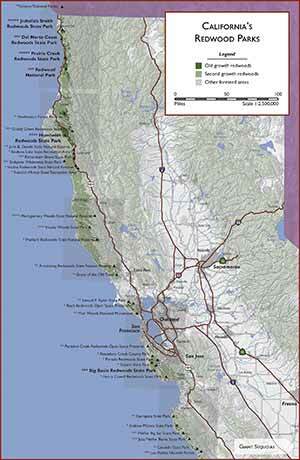 To your left, the Tarwater Trail Camp is a few minutes’ walk away. 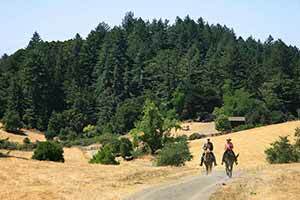 Turn right onto the Pomponio Trail, which starts off as a well-maintained dirt road. 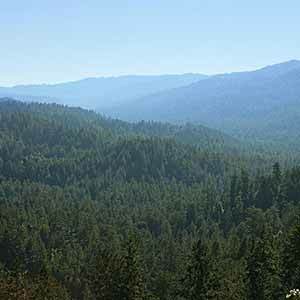 Although the redwoods are second growth, they are particularly tall and straight and some have the light bark color normally found only on old growth redwoods. Cross an auto bridge, which can be really slippery. The road leads to Honor Camp. 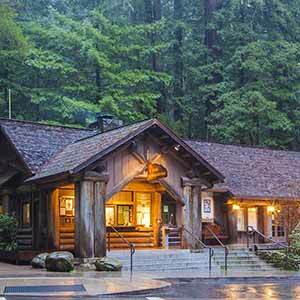 The camp was originally known as Camp Pomponio, a Boy Scout camp that opened in 1949 and was the predecessor to Cutter Scout Reservation. 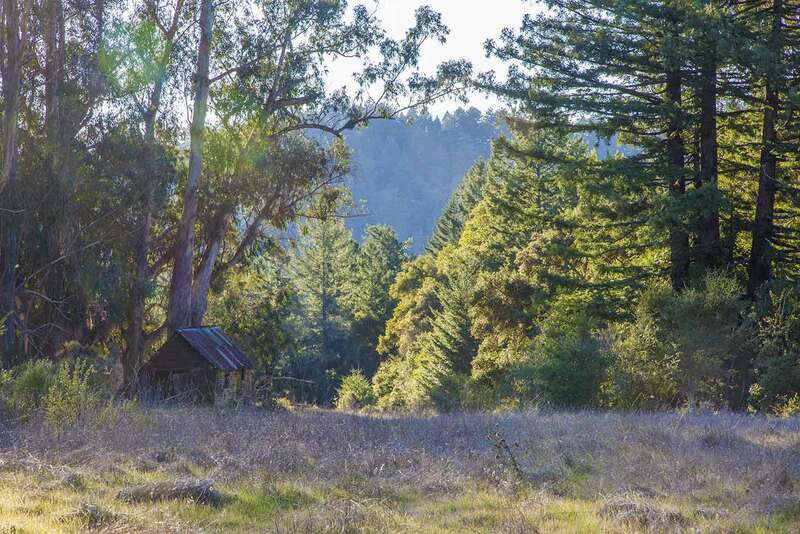 The Scouts relocated in 1962 when plans were being made to dam Pescadero Creek and create a reservoir that would have flooded the area and Portola State Park as well. The camp was turned into a county jail, but despite the imposing “keep out” signs it’s been abandoned since 2003. Turn off the road onto a singletrack trail. The trail climbs up a hillside through logged redwoods before leveling out in a rather dull, disheveled-looking tanoak and laurel forest. 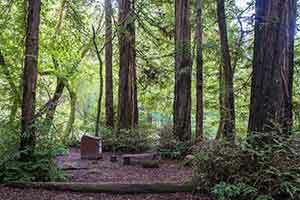 Just after the spur to Shaw Trail Camp, the scenery improves as the trail curves into Parke Gulch, where there’s a partially-logged grove of small to mid-sized redwoods with an attractive redwood sorrel groundcover. 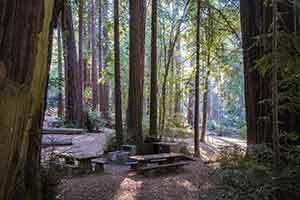 Take the new Parke Gulch Grove Trail, which is cut into a hillside above the gulch, offering a nice view of the grove and passing through a little cluster of old growth redwoods next to a bridge. 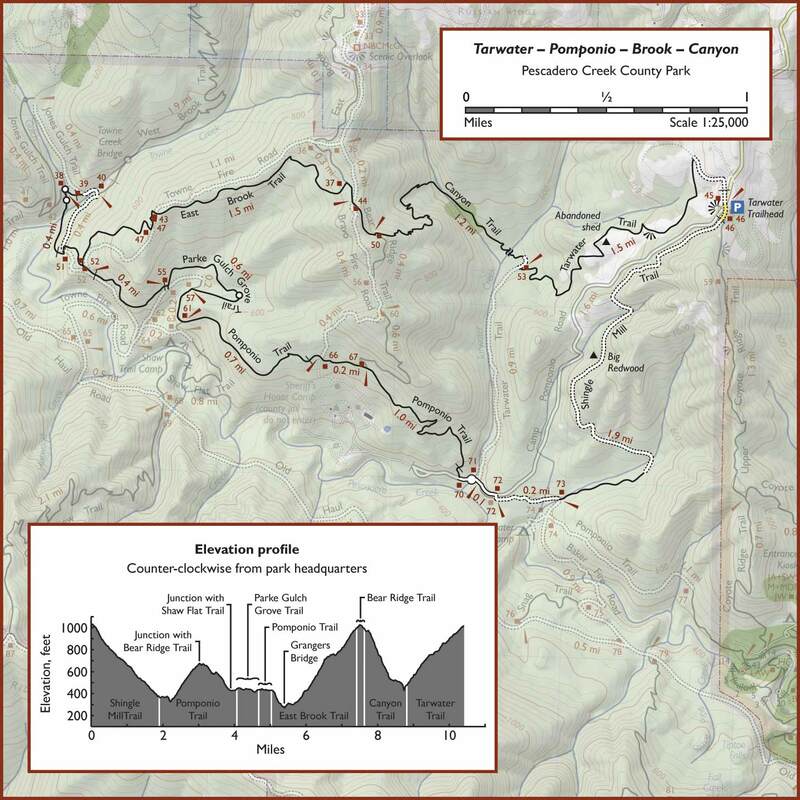 Continue along the Pomponio Trail to the intersection with the East Brook Trail. At this point, energetic hikers can take a half-mile side trip to Jones Gulch, one of the scenic highlights of the trip. 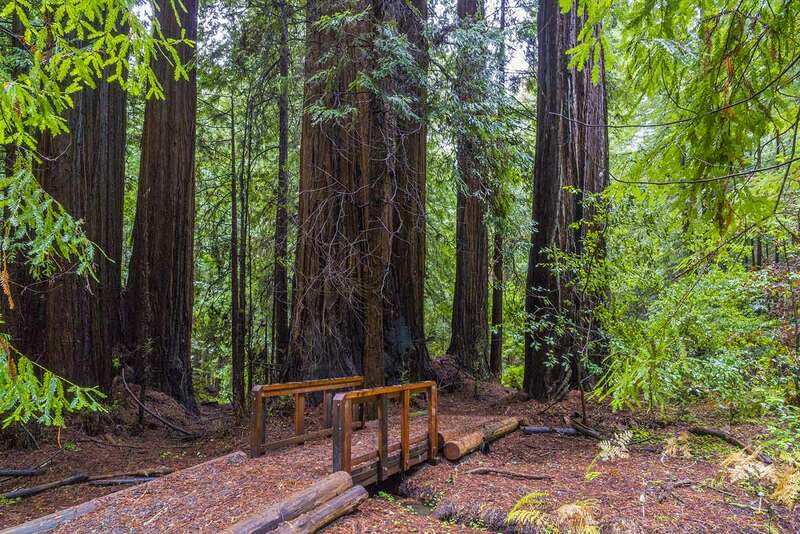 Here, a short section of trail with two footbridges passes through a clump of perhaps a dozen good-sized old-growth redwoods. The area is remarkably lush, with lichens covering the branches and redwood sorrel groundcover. Two creeks flow in surprisingly deep and narrow channels with vertical walls, joining near Grangers Bridge. After a heavy rainfall, a turbulent torrent of water rushes through the channels and over a miniature waterfall that’s maybe 6 feet tall. 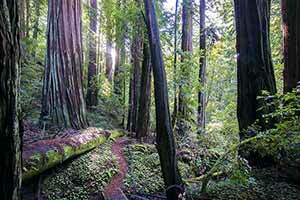 Return to the East Brook Trail, which climbs into a Douglas-Fir wood with scattered redwoods. 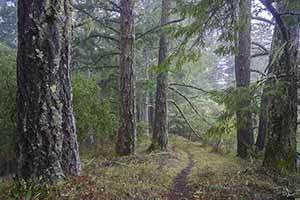 The woods get lusher and more attractive, the light-colored firs standing among an understory of ferns, as the trail climbs up to Bear Ridge. The Canyon Trail descends from the ridge through second-growth redwoods. 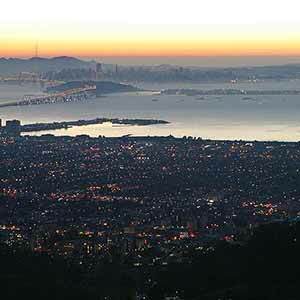 The sound of gunfire from the distant Los Gatos Rod and Gun Club can sometimes be heard, as can the sound of traffic from Skyline Drive. Fortunately these sounds can only be heard for about a quarter-mile, until the trail turns north. The bottom of the Canyon Trail. The redwoods are small but appear to be unlogged. 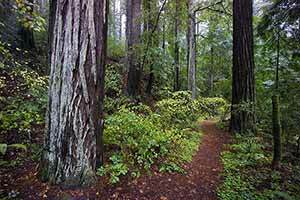 The trail enters a cool, dark ravine where the biggest redwoods of the hike grow amid a dense tanoak understory and a dusting of redwood sorrel. Unfortunately the upper half of the ravine has been logged, and big stumps are everywhere. 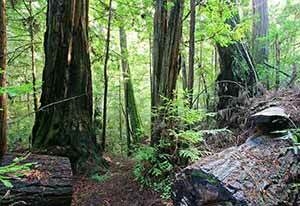 As the ravine narrows, though, the stumps gradually disappear and the trail briefly passes through a completely unlogged patch of canyon-bottom redwoods, the only full-blown old-growth grove of the hike. As the dark, narrow ravine opens up into a bright and relatively open flat, the big redwoods with their tanoak and redwood sorrel understory give way to smaller redwoods with a dense huckleberry groundcover. The redwoods are remarkably straight and tall, especially compared with the irregular-looking redwoods in the logged area, and despite being smaller they still appear to be unlogged. Overall, the lower Canyon Trail is the most scenic part of the hike. The trail then crosses Tarwater Creek. There’s no bridge here but the creek isn’t more than 6 inches deep even after it rains. When the water is low, you can see how the creek got its name — a thick scum of black tar accumulates on rocks and over still waters. There’s a final nice patch of redwoods after the creek crosing. Turn left onto the Tarwater Trail to begin the climb back to the parking lot. 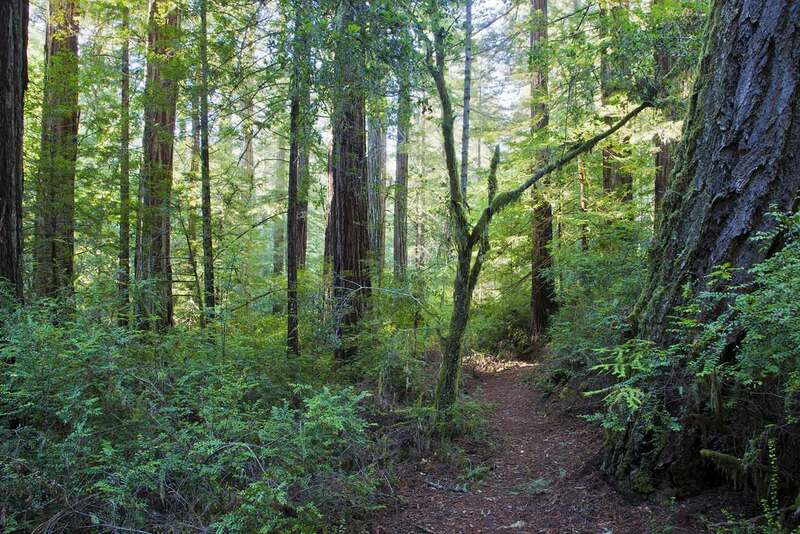 Stumps appear almost immediately, and soon the trail leaves the redwoods altogether, climbing through open grassland alternating with patches of oak woodland. There are some views of conifer-clad Butano Ridge as well as an abandoned shed.